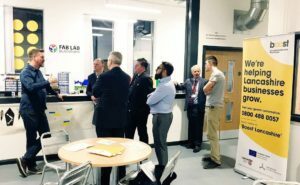 The Making Rooms is not just a makerspace but is the hub of Blackburn with Darwen’s growing community of entrepreneurs, craft businesses, artists and startups. 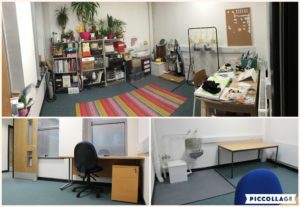 Our co-working environment provides a variety of space for rent or hire in the form of offices, workshops, creative studios, meeting spaces, training rooms and exhibition space at highly competitive rates with discounts for startup businesses. 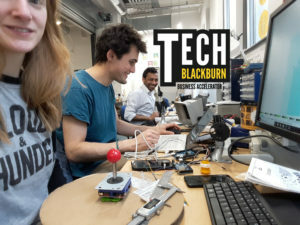 The Making Rooms is also the home for Blackburn’s first ever startup accelerator, TECH BLACKBURN, a quarterly programme with cohorts of 8 to 10 entrepreneurs bringing their new business ideas to life within a co-working environment. Situated right in the heart of Blackburn town centre, The Making Rooms hosts a digital fabrication facility where anyone can design, make, experiment, develop, learn and play with a wide range of equipment from high-tech digital manufacturing such as 3D printing to traditional craft such as pottery. We don’t do all this alone though but surround ourselves with an ecosystem of support for individuals and small businesses including finance; product development; marketing; business development; and innovation to name but a few. We are turning our largest studio/workshop into hotdesking space! 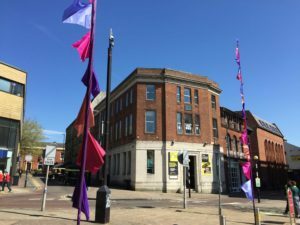 Room 201 has been fitted out to work as a communal space where you will rent a desk for the month and enjoy sharing the room with like mined creatives. All rooms qualify for small business rate relief so no rates will be payable. As we are nearly full, you may want to join our waitlist to be first considered when one of our studios come available. We are looking for fresh new start-ups and entrepreneurs making anything from art to high-tech gadgets that can make the best use of our facilities. We provide a low risk and flexible environment for young companies to grow, develop and collaborate. Meet our current tenants on this page.